Landscaping/Lawn/Garden O & D LANDSCAPING - Landscape maintenance, special on colored mulch, patios & retaining walls, spring clean up. Tree services. Free estimates & Fully Insured. 262-812-9943. Obituaries AGNES "AGGIE" MARIE PAVLIK Agnes “Aggie” Marie Pavlik, 88, of Waterford, passed away peacefully with her family by her side on March 13, 2019. Aggie was born in Sturgeon Bay on July 29, 1930 to Edward and Shirley (nee Berger) Schroeder. She met the man of her dreams, Rudolph “Rudy” Benedict Pavlik and they were married on July 11, 1953 in Sturgeon Bay. They lived in South Milwaukee until 1988, then enjoyed retirement in Crossville, Tenn. and finally settled in Waterford in 1998 to be nearer to family. Aggie was a fantastic quilter. She enjoyed reading, traveling and a good joke. She will be dearly missed by all. Aggie is survived by her loving husband of 65 years, Rudy; her children, Linda (Curtis) Connor, Barbara, and Shirley (Keith) Brungraber; six grandchildren, Robert (Shana) Hansen, Daniel (Sandy) Tipler, Ashley Tipler, Andrew Connor, Marcus (Lissa) Connor, and Abby Connor; nine great-grandchildren; in-laws, Charlotte Schroeder, Nancy Schroeder, and Arlen Ortlieb; other relatives and friends. She is preceded in death by her parents; sister, Hazel (Larry LaFontaine); four brothers, Harvey (Audrey), Norbert (Alvaretta), Clifton, and Paul (Bonnie). A Memorial Gathering will be held at St. Thomas Catholic Church, 305 S. First St. in Waterford, on Tuesday, March 26, 2019 from 9:30 to 10:45 a.m. with Mass beginning at 11 a.m. A light luncheon will follow Mass. A committal service will take place at 2 p.m. at the Southern Wisconsin Veterans Memorial Cemetery, 21731 Spring St. (Hwy C) in Union Grove. Aggie's family wishes to thank the staff at Oak Ridge Care Center and Seasons Hospice for the loving care and comfort they gave Aggie during her stay. Mealy Funeral Home is serving the family. Well-wishers may visit www.mealyfuneralhome.com. Obituaries LOUISE A. "LOUAN" LUETTEN Louise A. “Louan” Luetten, 91, of Burlington, passed away Thursday, March 14, 2019 at Lake Geneva Manor. Louan was born on Feb. 20, 1928 in Burlington to Joseph and Ruth (nee Morrissey) Pihringer. She attended and graduated from St. Charles Grade School and Burlington High School. She also attended the Milwaukee School of Business. On April 7, 1951 at St. Charles Catholic Church, she was united in marriage to Ralph Luetten. Following marriage, they continued to reside in Burlington. Ralph preceded her in death on Dec. 19, 1991. Louan was a life-long resident of Burlington and worked as a bookkeeper for Luetten Electric. She also was a receptionist for Drs. Mastalir and Ryall, and a dental assistant for Dr. Ryall. She was a member of St. Charles Catholic Church, American Legion Auxiliary and St. Ann's Society. She volunteered regularly at St. Charles and worked in the church office. She enjoyed playing bridge and attending plays and other theater productions. Louan is survived by her daughter, Kathleen (James) Butenhoff; grandchildren, Nick (Molly) Butenhoff and Zack Butenhoff; great-grandchild, Liam Butenhoff; siblings, James (Marilyn) Pihringer and Carol Pihringer; brother-in-law, Roger Luetten; and sisters-in-law, Jane Siegler and Rita Graul. She was preceded in death by her parents, husband, brother Kenneth (Bette) Pihringer, and brothers and sisters-in-law, Aileen Luetten, Mary Ann (Ray) Seidel, Evelyn Otto and Lucille (Al) Frederick. The family would like to thank her friend, Judith Bauman and the staff at Lake Geneva Manor for their concern and care during this time. Memorial contributions may be made to St. Charles School. Visitation and services for Louan were held Wednesday, March 20, 2019 at St. Charles Catholic Church. Burial took place immediately following the service at St. Charles Catholic Cemetery. Schuette-Daniels Funeral Home is serving the family. Well-wishers may visit www.danielsfamilyfuneral.com. Obituaries Merlyn J. Eickman Merlyn J. Eickman, 90, Pecatonica, died at 11:45 a.m., Thursday, March 14, 2019 in Pinecrest Nursing Home in Mt. Morris. Born Sept. 12, 1928 in Seward, the son of Mr. and Mrs. John and Ella (Timrotte) Eickman. He attended Seward School from 1st grade to 10th grade and graduated from Leaf River High School. Married Audrey Potter and then married Eunice A. Carlson on July 31, 1964; she died Jan. 15, 2003. Merlyn then married Marilyn Marshall in Feb. 18, 2006. He owned Eickman's Processing Company, Inc. in Seward. He was a member of First Congregational Church in Pecatonica, America Association of Meat Processor, Illinois Association of Meat Processor; Pecatonica Rotary Club, Pecatonica Fire Department Board of Trustees, A.W. Rawson Ma-sonic Lodge #145, Scottish Rite Bodies in Freeport, Tebala Temple, Twelve Mile Grove Cemetery Board, Illinois Board of Livestock Commissioners. Survivors include children Mike (Deb) Eickman, John (Jane) Eickman and Shelly Summers; step daughters Linda (Ron) Mitchell, Gerry Thompson and Patricia Eckberg; step sons Gordon (Marsha) Dirksen and Jeff (Linda) Dirksen, Geri (Butch) Duffy, Melody (Gary) Henderson, Mike (Jan) Marshall, Pat (Rhonda) Marshall, Kevin (Mary Kate) Marshall. He was preceded in death by his parents, mother of his children Audrey Potter, wife Eunice, grandsons Chance Summers and Jerimiah Eickman, brothers Al, Wendel, Ken; sister Leora, Virginia Erdahl, Steve Ridenour Funeral ceremonies will be held at 11 a.m., Thursday, March 21 in First Congregational Church, 633 Reed Street, Pecatonica, with Pastor Duane Hoffman officiating. Burial will be in Twelve Mile Grove Cemetery, Pecatonica. A visitation will be held in McCorkle Funeral Home-Pecatoncia Chapel 203 West 5th Street, Pecatonica, from 4 to 8 pm, Wednesday, March 20, with a Masonic Service to be held at 7:45 p.m. Memorials may be given to the Pe-catonica Fire Department 1221 Main Street, Pecatonica, IL 61063 or your favorite charity. To share a memory or send an on line condolence, visit www.mccorklefuneralhome.com. Obituaries Tom Benezra, 60 Tom Benezra passed away suddenly from atherosclerotic cardiovascular disease on January 31, 2019, at the age of 60. Tom played varsity tennis at York High School, and was part of the class of 1976. He played varsity ten-nis at the University of Ore-gon, then at Northwestern University. After graduating from college, Tom played the professional tennis circuit, while also being a club tennis pro/instructor. Switching professions, Tom became a salesman of men's clothing. Tom went on to spend 18 years in the wine business. He was often quoted in the Chicago Tribune's wine col-umn and other wine litera-ture. Many of his customers praised his talent for recom-mending the perfect wine. Most recently, Tom was a senior design consultant at a window treatment company. He was a member of the Elmhurst Art Museum and the Elmhurst Historical Soci-ety. He frequently attended Elmhurst Symphony Orches-tra concerts. He loved to play the piano and occasionally, composed his own music. Tom was a sensitive, phi-losophical, caring human being. He was athletic, ac-tive, loved to cook, ate healthfully and never drank to excess. He led a responsi-ble, full and productive life until the day of his passing. Tom is survived by his life partner, Marianne Lanning; his brother Philip (Felicia), and Phil's son Noah (Katie); his sister Beth Benezra and her three children, Elise, Ra-chel and Quinn Cordo; his stepmother Barbara Benezra; his stepsiblings Beth Morovich, Chuck (Lisa) Saletta, Jr., and Kate Saletta; as well as many other rela-tives and friends whose lives he touched. Tom was prede-ceased by his parents E. Eliot Benezra, MD and Betty Howe Schreiber (Howard). Tom's body was cremated. A Memorial Gathering will be held on Saturday, March 30 at 2:30 p.m. in the Alexander Room of the Frick Center on the campus of Elmhurst Col-lege. Donations in Tom's memory are appreciated to the Elmhurst Art Museum (elmhurstartmuseum.org), the Elmhurst Historical Society (elmhursthistory.org), the Elmhurst Symphony (elmhurstsymphony.org) or a charity of your choice. Ar-rangements provided by the family. Obituaries James V. Fennell James V. Fennell, formerly of Oakbrook Terrace, passed away on March 13, 2019. Loving son of the late Arthur and Kathryn Fennell, Dear brother of Kevin (Terry) and Sean (Kathy) Fennell and the late Mary Rita (Ron sur-vived) Dettling. Fond uncle of Joel, Kyle (Chanity), Ian Fennell, Katie (Steve) Pruitt, Christopher (Jehan), Colleen, Jennifer Fennell, Andrew (Samantha) Dettling and Becky Dettling. And several grand nieces and nephews. Memorial visitation will be Saturday March 23, 2019 at 9 a.m. until Mass time at 10 a.m. at Ascension of Our Lord, 1 S 314 Summit Ave, Oakbrook Terrace. Interment private. Memorials to Parkin-son's Foundation or Parkin-son.org or parkinsonvoice-project.org/Donate. Ar-rangements by Steuerle Fu-neral Home 630-832-4161. Obituaries MARILYN JOY STEBEN, 79 Marilyn Joy Steben, nee Hitzeman, age 79, of St. Charles, formerly of Lombard, passed away on Sunday, March 17, 2019. She was born on October 19, 1939. Marilyn is survived by her loving husband Arnold Steben; children Jeff (Patti) Steben, Greg (Kathy) Steben, Lynne (Brad) Drew, Rick Steben, and Julie (Kurt) Bickler; 16 grandchildren; 8 great-grandchildren; and her sister Kathleen (Keith) Hawley. Marilyn worked for Northern Trust in Chicago as well as a Realtor in Lombard. Member of Trinity Lutheran Church for more than 60 years. Visitation Thursday, 4-7 p.m. at Knollcrest Funeral Home, 1500 S. Meyers Rd. (3 Blks. S. of Roosevelt) Lombard. In state Friday, 9 a.m. until time of service at 11 a.m. at Trinity Lutheran Church, 1165 Westmore-Meyers Rd, Lombard. Memorials can be given to Trinity Lutheran Church. Funeral info: www.knollcrest.net or 630-932-1500. Obituaries JEROME K. LAURENT Jerome K. Laurent, of Whitewater, died March 16, 2019, at age 79. Jerry was born to Francis W. and Grace King Laurent on Jan. 8, 1940, in Knoxville, Tenn. The family soon moved to Washington, D.C., where Jerry was baptized at Christ's Church in Alexandria, Va., and where he attended school in Georgetown. The Laurents moved to postwar Germany in 1946, where Francis helped the U.S. government reorganize German industry and where Jerry attended British and American schools. In 1948, the family returned to the U.S. to a stone farmhouse near Thorp in Clark County. He attended a one-room school and was active in 4-H. The family moved to Stanley in 1952, Jerry's eighth-grade year. During his sophomore year at Stanley High School, he had rheumatic fever for eight months. Still, he graduated as valedictorian in 1957. Jerry graduated from UW-Eau Claire with honors in 1961 with a B.A. degree in economics and history. He attended graduate school at Indiana University-Bloomington and earned his M.A. and Ph.D. degrees in economics. Jerry met his wife, Virginia, at Indiana University, where she earned a master's degree in teaching. They married in August 1966 and moved to Whitewater. He was appointed an assistant professor of economics at UW-Whitewater in 1965. They had two children, Katherine, born in 1973, and Thomas in 1976. Jerry loved teaching and won the W.P. Roseman Award for Outstanding Teaching at UW-Whitewater in 1975. He won a prize for a research article submitted to Explorations in Economic History, a British journal. He also received the UW-Whitewater Outstanding Service Award in 1993. In 2005 he received the President's Award from the UW-Eau Claire Alumni Association. Professional memberships include Omicron Delta Epsilon Honor Society in economics; the Wisconsin Economics Association; the Association of Great Lakes Maritime History; and the Greater Chicagoland Friends of Economic History. Jerry was active in the former St. Luke's Episcopal Church in Whitewater and was a charter member of Kiwanis Breakfast Club. He led in the development of the Lutheran/Episcopal campus ministry and served on the board for many years. Jerry was preceded in death by his parents; brother-in-law, Gordon Norlin, and sister-in-law, Carol B. Huggins. He is survived by his wife, Virginia, and two children, Katherine Laurent and Thomas Laurent of Chicago; his sister Joyce and her sons, Jim (Monica) and Paul; and his sister-in-law Margaret Pernau. A funeral service will be held at St. Peter's Episcopal Church at 11 a.m. on Friday. Visitations will be at two locations: Nitardy Funeral Home, Whitewater, from 4 to 7 p.m. on Thursday and at 10 a.m. on Friday at St. Peter's, 302 Merchants Ave., Fort Atkinson. Memorials may be given to the Jerome K. Laurent Economic Scholarship fund of the UW-Whitewater Foundation, St. Peter's Episcopal Church or the Stanley Area Historical Society. Obituaries BRENDA C. BERGER Brenda C. Berger, 67, of Twin Lakes, passed away Friday, March 15, 2019 at her home with her family. Brenda was born in Haleyville, Ala. on July 6, 1951, to Vanous and Mary Lee (nee Rye) Cooper. She spent her early life in Alabama before moving to Wisconsin in 1960, where she attended Salem Grade School and Westosha Central High School. On December 11, 1968 in Waukegan, Ill. she was united in marriage to Roger Berger. Following marriage, they resided in South Milwaukee before moving to Salem and then Twin Lakes in 1976. Brenda was a resident of Twin Lakes for 43 years. She was a full-time mother for many years. She co-owned Roger's Auto Sales with her husband for 26 years. She also worked part-time for the Burlington Standard Press and then for Kohl's Department Store in Kenosha for 17 years before retiring in 2018. Brenda enjoyed reading, cooking, ancestry research, following true crime and listening to Elvis Presley. More than anything, she lived for her family. She was a loving and caring wife, mother, grandmother, sister, aunt, great-aunt, and friend to so very many. Brenda is survived by her husband, Roger; children, Rachelle “Shelly” (Tom) Poteracki, Ryan (Cindy) Steinbeck and Michael (Sandra) Steinbeck; grandchildren, Sarah Poteracki, Amy Poteracki, Adam Steinbeck and Alex Steinbeck; siblings, Wanda (Chuck) Dohse and Ken Dohse; special nieces who were like daughters to her, including Cheryl, Debbie, Karen, Lisa, Corinne and Laura; and extended family of brothers- and sisters-in-law; and many Dohse family stepsisters, stepbrothers, nieces and nephews. Brenda was preceded in death by her mother, Mary Lee (Rye) Dohse; father, Vanous Cooper; step-father, Raymond Dohse; grandparents Ova Lee and William (Mack) Cooper, and Jesse and Kever Rye; aunts, uncles and cousins (including her distant cousin Elvis). The family would like to thank the nurses and care givers with Aurora Health Care and Aurora at Home (Hospice) for their care and concern during Brenda's long, courageous battle with cancer. A celebration of life will take place at a later date. Per Brenda's wishes, a private committal service will take place at Southern Wisconsin Veteran's Cemetery. Schuette-Daniels Funeral Home is serving the family. Well-wishers may visit www.danielsfamilyfuneral.com. Obituaries DR. STEPHEN "STEVE" F. DIRKS Dr. Stephen "Steve" F. Dirks, 92 went home to be with his Savior, surrounded by his loving family on March 14, 2019. Steve was born Dec. 8, 1926 to Bernard and Pearl Dirks in Massachusetts. He graduated from Blackburn University in 1947 with an Associate Degree in Arts. He went on to attend the University of Massachusetts where he graduated in 1949 with a Bachelors Degree in Science. Steve continued his education in Iowa, where he attended the Iowa State College of Agriculture and Mechanic Arts. There he met the love of his life Ann and they were united in marriage on Aug. 31, 1951. He was a fraternity member of Phi Zeta, as well as part of the Iowa State Student chapter of the American Veterinary Medical Association. He graduated as a Doctor of Veterinary Medicine in 1953. After graduating, Steve and Ann moved to Wisconsin, where he practiced as a licensed veterinarian from 1953 to 1994. He ran Waterford Veterinary Clinic for 40 years. Steve's commitment to his passion for veterinary medicine led him to continue his education by graduating from Surge Dairy School as a Master Dairyman in 1962, as well as attending Wisconsin's Academy for Veterinary Practice in 1984. He also held a membership with the Wisconsin Veterinary Medical Association for 50 years. Steve will always be remembered as a servant of the Lord and of his community. He was an active member of the Community United Methodist Church of Waterford. He was active in the Civil Rights Movement in the 1960s and 1970s. He was an organizer for the Bike-A-Thon for St. Jude's Hospital. He served on the Waterford Graded School Board for 10 years and he also tutored English as a second language. Steve will be dearly missed by his loving wife Ann; his children, Suzanne Marie (Richard Wayne) Rivers Jr., Karen Elaine (Hung) Hoang, Paul Phillip (Amber Mary Ericka) Dirks, Timothy Stephen (Mona Beth) Dirks; his grandchildren, Nicholas Phillip (Marlee Michelle) Rivers, Stacey Kenzie Rivers, Marianne Margarite Rivers, Stephen Wayne Rivers, Cynthia Elaine Rivers, Richard Wayne Rivers III, Olivia Kay Rivers, Dunstan Dung Hoang, Genevieve Anh Trang Hoang, Amari Christopher Dirks, Anissa Janae Dirks, Fioana Catherine Dirks, Zoe Alexandra Dirks, and Sarah Beth Dirks. He is further survived by his great grandchildren Delaney Suzanne Rivers and Jameson Tyrel Rustand; as well as many friends and community members whose lives he impacted while here on Earth. Steve was preceded in death by his parents Bernard and Pearl; his daughter Cynthia Elaine Dirks, and his siblings Debby Dirks Hugan, Margaret Dirks Harmed, Robert Dirks, and Phillip Dirks. A celebration of Steve's life will take place on March 23, 2019 at Community United Methodist Church, 455 S. Jefferson Street in Waterford. Visitation will be from 9:30 to 11:45 a.m., followed by a memorial service at noon. Steve will be laid to rest at Oakwood Cemetery in Waterford at 2:30pm. Services Entrusted to Integrity Funeral Services. Well-wishers may visit www.integrityfunerals.net. Obituaries ASHLEY ANDITON Ashley Anditon, 34, of Darien passed away on March 14, 2019. She was born in Melrose Park, Ill., on Nov. 16, 1984. Ashley will always be remembered for her loving free spirit. Ashley is survived by her father, Thomas Anditon, of Darien; mother, Cynthia Marlow, of Villa Park, Ill.; stepmom, Julie Anditon, of Darien; eight siblings, Renee (Cody) Giese, of Plover, Thomas (Jessie Pinkstaff) Anditon Jr., of Janesville, Alex Kiel, of Villa Park, Ill., Joshua Anditon, Ryan Anditon, Nicholas Anditon, Lucas Anditon and Kalynn Anditon, all of Darien; a nephew, Reed Giese; and a niece, Quinn Giese. Funeral services will be held at 5 p.m. on March 22, 2019, at Faith Baptist Church, 1500 Creek Rd. in Delavan. Visitation will be held from 2 p.m. until the time of the service on Friday at the church. In lieu of flowers, memorials can be directed to Ashley's Family. Monroe Funeral Home in Delavan is assisting the family. Obituaries TIMOTHY J. SULLIVAN Timothy J. Sullivan, 63, of Mukwonago, passed away March 13, 2019, at his home surrounded by family in Mukwonago. He was born in Evergreen Park, Ill., on Oct. 23, 1955, to C. Edward and Joan (Shorley) Sullivan. Tim was united in marriage to Debra Vegter on March 22, 1986, in Fontana. He was a bank examiner for the U.S. Treasury for many years until retirement. Tim belonged to the Woodworkers Club in the Waukesha County area. Tim is survived by his wife of 32 years, Debby; a daughter, Megan Sullivan (husband Bryan Van Stippen); a son, Michael Sullivan (Amy Runkle); two sisters, Faryl (Dennis) Krause, of Delavan, and Shawn Sullivan, of Grayslake, Ill.; and many nieces and nephews. He is preceded in death by his parents; and a brother, Thomas. Private family services will be held. Memorials can be directed to the Stars and Stripes Honor Flight, www.starsandstripeshonorflight.org/donate. Monroe Funeral Home in Delavan is assisting the family. Obituaries SHARON PAULINE JACQUART Sharon Pauline Jacquart, 76, of Burlington, passed away peacefully with her family by her side on March 13, 2019 at The Elder Care Cottages in Waterford. Sharon was born in Ironwood, Mich. on April 3, 1942 to Russell and Francis (nee Orsoni) Thomas Sr. Sharon grew up in Ironwood and after graduating high school met the love of her life Morris Wallace Jacquart. They were married in Ironwood and resided there for a short time before moving to Milwaukee, then Burlington, where they have lived for 55 years. Sharon was a devoted member of St. John the Devine Episcopal Church, the Lady's Auxiliary, the local VFW and the Red Hat Society. She loved camping and playing cards, her favorites games were Bunco and Euchre, and gambling in Las Vegas. She had a very good sense of humor and many friends. She was a devoted, loving wife and mother and a very good friend to many. She will be dearly missed. Sharon is survived by her children, Michelle (Jake) Fullard and Steve Jacquart; grandchildren, Carly Jacquart, Alexis (Chester) Williamson and Ashley Fullard; sisters, Yvonne (Walter) Rohrer and Mary Ann (Bruce) Hudson; her dogs, Charlie Brown and Oliver; other relatives and many friends. She is preceded in death by her parents, husband Morris, and daughter Joan Marie Malzow. A Memorial Gathering will be held at St. John the Divine Episcopal Church, 216 E. Chandler Blvd. in Burlington on Saturday, March 23, 2019 from 9 to 10:45 a.m. with the Memorial Service beginning at 11 a.m. A light luncheon will be served following the memorial service. Sharon's family wishes to thank the staff at The Elder Care Cottages and Compassionate Care Hospice for the loving and compassionate care of their Mom during her time there. Mealy Funeral Home is serving the family. Well-wishers may visit www.mealyfuneralhome.com. Obituaries JOIE N. GIESE Joie Noel Giese, 36 of Delavan, died of natural causes suddenly at her residence on March 15. She was born Feb. 12, 1983 in Elkhorn to Steven D. Giese and Robin Lee Jutz. She graduated from DDHS and was a cook in several area restaurants. Joie is survived by her mother, Robin L. Parsons of Racine, and father Steven Giese; sister, Nicole (Brian) Hunt of Racine; nieces, Eris and Trillian; aunts, Cindy, Rebecca, Betty, Aimee and Corrine; uncles, Earl, David, Aaron, Jessie, Peter (Sherri) and John (Tracy) and numerous cousins. A gathering will be held Friday, March 22 at Betzer Funeral Home from 5 to 7 p.m. Memorials to the family are welcomed. Betzer Funeral Home is serving the family. Obituaries JANETTE M. LEACH Janette M. Leach, 91, of Elkhorn, died March 15, 2019, at Ridgestone Gardens in Elkhorn. She was born Nov. 24, 1927, in Delavan, to the late George W. and Florence I. (Earnest) Cobb. On Jan. 5, 1952, she was united in marriage to John “Jack” H. Leach in Elkhorn. She was a member of St. Patrick's Catholic Church, involved with the Patricia Club, and for over 27 years was collection counter, and she was a charter member of the Elkhorn Junior Women's Club. Janette was a devoted and loving wife, mother, grandmother and great-grandmother who will be deeply missed by her husband of 67 years, Jack; her three children, Patricia “Pat” (John) Hohlfelder of Elkhorn, Timothy “Tim” Leach of Elkhorn, and Susan “Sue” (John) Bagnall of Mishawaka, Ind. ; eight grandchildren and 16 great-grandchildren. She was preceded in death by her daughter-in-law, Tammy Leach, and her two brothers, George and John. Private family funeral service will be held at Haase-Lockwood & Associates Funeral Homes and Crematory 730 N. Wisconsin St. Elkhorn. Memorials may be made in Janette's Name to: Elkhorn Food Pantry 14 W. Geneva St., Elkhorn, WI 53121 or St. Patrick's Catholic Church 107 W. Walworth St. Elkhorn, WI 53121. Obituaries RAFAEL HERNANDEZ SR. Rafael J. Hernandez Sr., 86, of Delavan, passed away March 14, 2019, at Mercy Hospital in Janesville. He was born in Mexico, on Sept. 11, 1932. Rafael was a longtime owner of Hernandez Restaurant in Delavan. Rafael is survived by his children, Maria Nieves, Laura (Eduardo) Davila, Elizabeth Torres and Rafael Hernandez; grandchildren, Alejandra, Penelope, Gabriela, Trent, Hannah, and Stephanie; great grandchild, Liam; sisters, Lupe, Carmela, and Coco; and many nieces and nephews. He is preceded in death by his parents and a brother, Reynaldo. Memorial services were held Monday at St. Andrew's Catholic Church, 714 E. Walworth Ave in Delavan. In lieu of flowers, memorials can be directed to the Hernandez Family. Monroe Funeral Home in Delavan is assisting the family. Obituaries THOMAS L. KANILLOPOOLOS, 87 Thomas L. Kanillopoolos, age 87, of Villa Park, died March 14, 2019. Thomas was the beloved husband of the late Belle Jane nee Willett; loving father of Mary (Michael) Ciardiello of Villa Park; stepfather of Jane (Richard) Gregory of Lombard; grandfather of Teadra Gregory of Lombard, Christina (Nicholas) Perrino of Glen Ellyn and Richard Gregory of Lombard; great-grandfather of Joseph, Michael, Lilana and Anthony; dear brother of John Kanillopoolos of Lansing, Michigan; and brother-in-law of the late Sebert A. Willett, U.S. Navy KIA WWII at Normandy. A Funeral Service will be held Wednesday, March 20, at 10:30 a.m. at Brust Funeral Home, 35 S. Main St., Lombard. Private Interment at Maple Hill Cemetery, Charlotte, Michigan. Thomas was a Veteran of the U.S. Army, having served in the Korean War with the 24th Infantry. He had lived in Villa Park for 57 years. He was a graduate of Michigan State University. Thomas worked in Transportation for various companies. He loved animals. Visit www.brustfuneralhome.com or call 888-629-0094 for information. Obituaries Betty (Herbig) Devine Betty went to join her parents and siblings in heaven on March 11, 2019. Betty was born and raised in Pecatonica and graduated from high school in 1954. She spent the majority of her life then living in northeastern Wisconsin, raising her children mainly in Peshtigo. Working many different jobs but retiring as a C.W. operator for Kimberly Clark Paper. She is the mother of three children Betty (John) Koranda, Pat (Shelly) Devine and Bill (fiance Nikki) Devine. Also a very proud grandmother of 10 grandchildren and five great grandchil-dren. Betty enjoyed going to sporting events for her children and grandchildren, traveling and being with her family. Betty was preceded in death by her father Harvey and mother Verbena Herbig. She was the last of the Herbig siblings (Earl, Leslie, Paul, Lyle, Louise, Harvey Jr., Bell, and Carol) to join the family in heaven. She will be dearly missed by her family and friends. A memorial service was held on Saturday, March 16, from 11 a.m. to 2 p.m. at Berth and Rosenthal Funeral home in Peshtigo, WI. Misc. For Sale TREADMILL FOR SALE - Proform treadmill, in good shape, new track, works well. $35 OBO. Call daytime 414-588-4352. Misc. For Sale DRAW-TITE BICYCLE CARRIER - Holds 4 bicycles and fits 2" receiver - heavy duty with taillights. Like new. $100. 262-275-8071. Notice CLASSIFIED IN-COLUMN ADS - cannot be credited or refunded after the ad has been placed. Ads canceled before deadline will be removed from the paper as a service to our customers, but no credit or refund will be issued to your account. Wanted to Buy WANTED - Old tackle boxes and fishing lures, top price paid, cash. Greg, 262-930-1069. Wanted to Buy WANTED TO BUY - non working washers & dryers, in repairable condition, no front load washers. 262-539-3165. Crafts CRAFT & VENDOR FAIR - April 6, 2019, 9 AM - 2 PM at the American Legion Post #209, 3913 S. State Rd. Hwy 213, Orfordville, WI. We have room for more crafters & vendors. 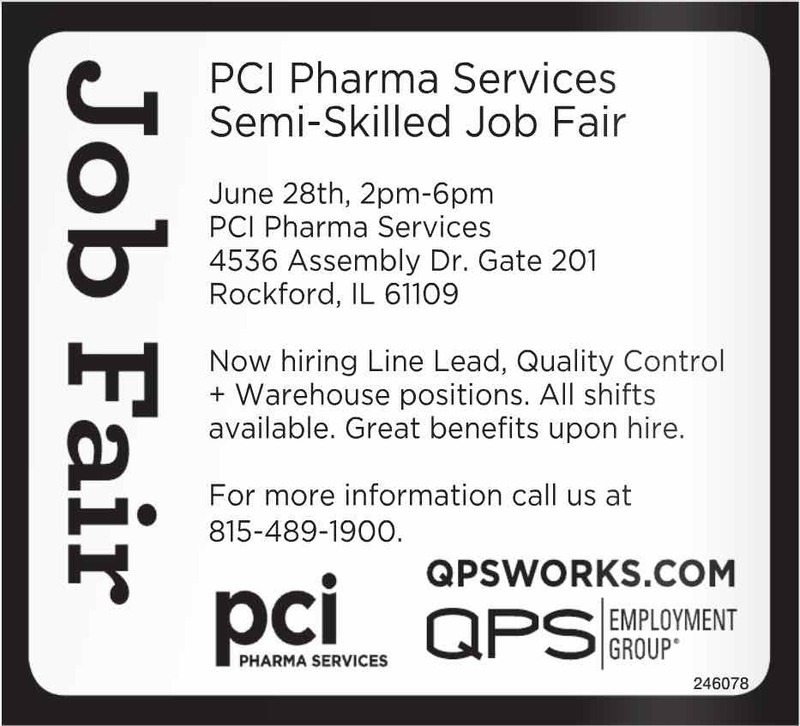 Call 608-295-8100 for more information. Misc. For Sale 2 MOBILITY SCOOTERS, - both need repair, $150 for both. Call 630-785-3168. Wanted to Buy HOUSE WANTED WITHIN - walking distance of Brodhead High School. Missouri grandparents moving to Brodhead. Call or text Grampa Walter 573-230-0773. Firewood / Fuel SPRING SPECIAL - Full cord, cherry, $250. Delivery available. 530-265-5159. Appliances APPLIANCES: WASHERS, DRYERS, STOVES & MORE - Cleaned, Serviced & Rebuilt. All in like new condition. Matching sets available $300-$350, Single Washer $125-$175, Dryers $125-$175. Local delivery, installation and free removal. 7am-7pm plus weekends. We also have in home repair service but if you are a do-it-yourselfer we sell parts. Master Card, Visa accepted. 262-448-4177. Collectibles SPORTS PICTURE - Sports picture in 8 x 10 frame, Baseball Immortals, Mickey Mantle and Ted Williams, Hall of Fame 1974-1966. $60.00. 262-441-3465. Appliances ELECTRIC STOVE - 30" w/double oven and vent fan. Blk glass doors, cream color, timer not working. $100. 262-728-3633. Announcements DISCLAIMER NOTICE - This publication does not knowingly accept fraudulent or deceptive advertising. Readers are cautioned to thoroughly investigate all ads, especially those asking for money in advance. Announcements CHILD CARE DISCLAIMER - No individual, unless licensed or holding a permit as a child care facility, may cause to be published any advertisement soliciting a child care service. A child care facility that is licensed or operating under a permit issued by the Illinois Department of Children and Family Services may publish advertisements of the services for which it is specifically licensed or issued a permit. 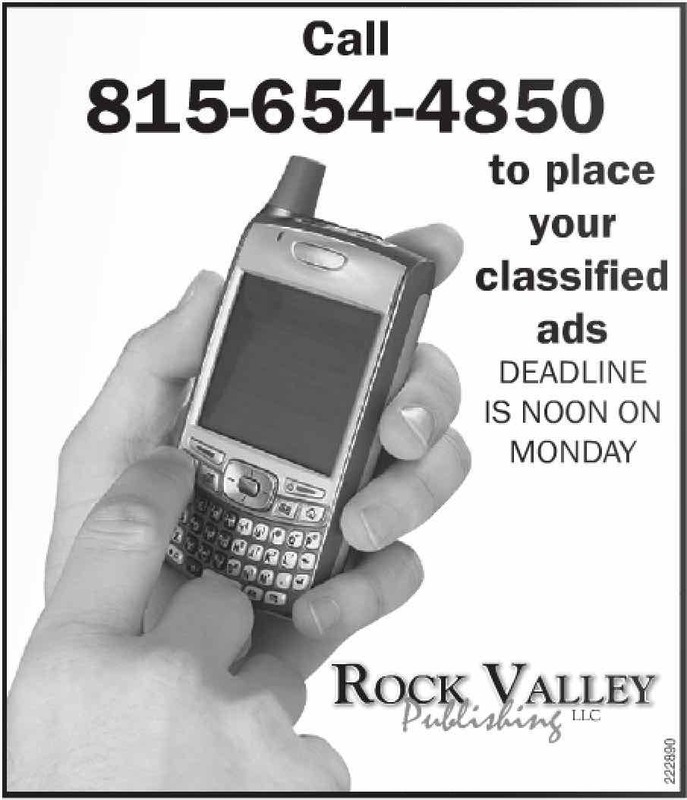 Rock Valley Publishing strongly urges any parent or guardian to verify the validity of the license of any facility before placing a child in its care.